Snowdrops galanthus have popped up around one of my tiny front ponds. 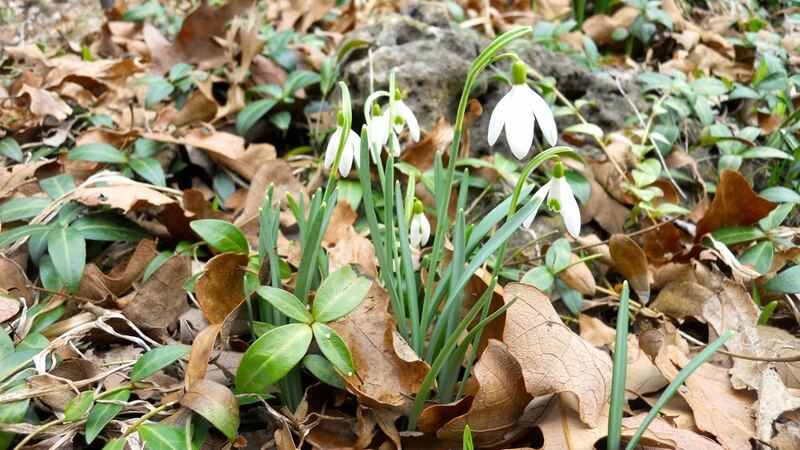 For the past 15 years or so, what blooms first in spring is now a surprise, with no two years the same and no two plants or flowers appearing in any semblance of order. As winter wanes in Missouri, it seems appropriate this year to have snowdrops galanthus popping up around one of my small ponds, a last winter hurrah before spring officially arrives on March 30. Not so fast, though. In the hardiness zone where I live, we can still have a blackberry winter as late as early May. Snow has been known to grace Easter and many daffodils have popped up only to be covered in white snowy blankets. This year, the snowdrops have company, my early yellow daffodils. They are not big, or splashy. These came from an abandoned home site that was 30 years old when I moved them a good 30 years ago. Once the regular daffodils start blooming, the small early daffodils fade in stature and presence but, to me, they hold a special place for being the first ones to bloom. You can pick the unopened buds and place them in water in a flower vase to enjoy the new blooms inside. Don't mix them with other flowers because daffodils have a toxin that make them inedible, and therefore safe, from wildlife. The toxin, however, will quickly wilt any other flowers you try to mix with daffodils unless you let the daffodils drain for a good day in a separate vase first. The first early daffodils have started to bloom, a sure sign spring is just around the corner. I have this first vase of spring daffodils sitting where I can easily see them. As I was admiring the bright yellow color, I spotted my painted gourd bee also appearing to look at the flowers. Daffodils are not a major nectar and pollen source for native or honeybees although I periodically will see bees flying into, or out of, the flowers. The large flower "noses" do invite a visit. This little painted bee is keeping an eye on the blooming buds, just as my outside bees are doing! It won't be long before my real honeybees outside will join the bumblebees and other pollinators flitting through the rest of the flowers blooming in my one-acre limestone hillside garden. Then I will know it really IS spring!